So are the meanings of written note values changing when she changes the denominator, as with the post-classical people? 'Cause if so, you could avoid that by just writing the 3/4 as 6/8, no? Are the 12/8 eighth notes supposed to have a triplet feel, as I'm used to? My prejudice changing denominators all the time (aside from not being used to it) is that it means players have to recalculate all the various note values from measure to measure, which makes it harder to read, if not necessarily to feel. Relax -- this is not as complicated as you think! There is no actual time signature shifting going on -- the bulería section we are talking about is notated entirely in 12/8. Maybe take another look at the post with fresh eyes. If you check out the noteated excerts carefully and listen along with the MP3 excerpt, and I think you'll find your questions are all answered. For instance, the example labeled "Maria's bulería pattern -- augmented," as well as the percussion (bottom) staff in each excerpt, show you how the 12/8 is subdivided. The first measure of the pattern has 4 groups of 3 eighths (like you'd normally expect in a bar of 12/8), and the second measure of the pattern has 3 groups of 4 eighths -- but the first accent of the second bar is on the third eighth note, instead of the downbeat. No, I shan't relax. It's not like just saying it can make it happen. Now, looking at the thing with the dotted eights, I could kinda sorta see the sense of having the the 1st bar in 2/4 and the second in 3/6 or 6/12 or whatever, but I still wouldn't like it.. I could see the reason that kind of in the "What is a compound without an element?" example because it avoided that weird thing where you had a triplet group starting on an eighth note upbeat, but unless that's something that turns up in this piece, I'd rather just stick to regular old easy-to-read eighths and triplets. I also don't like different clefs. And what's the deal with neckties? "I could see the reason that kind of in"="I could see the reason for that kind of notation in"
Also, insert some sort of smiley after the thing about shan't relaxing. ...'cause it was supposed to sound charming and cute. We love you, man, but you have got to read the posts. Once again, there is no change to 3/4. The bulería section of Maria's piece is notated in 12/8 throughout. I only showed the 6/8 + 3/4 example to illustrate a more abstract point about how the shift in the middle of the bulería rhythm feels -- the first half of it has a triple subdivision (2 groups of 3 eighths), and the second half of it is has a duple subdivision (3 groups of 2 eighths). 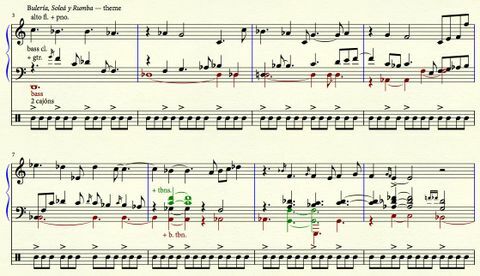 This notation is not used in the piece. None of the first four examples in the post appear in that form in Maria's score. They are there because I am explaining how you get from the pure, traditional bulería pattern to the modified pattern that is used. Maria's version is (like it says in the post) an augmented version of this pattern -- so, instead of 2x3 eighths + 3x2 eighths, it's 4x3 eighths + 3x4 eighths. OK, interest drifting to other things now, but I am sad to see that that wiki link says that evil notation is standard. I also wikipediaed "clave" but couldn't find it, but I hear it all the time. Name? So apparently it's called a West African or Nigerian Bell Pattern, which isn't as romantic sounding as I'd hoped. All done now. Oh well, I've already got 7 comments here already (profuse apologies for that), so I guess one more won't do too much harm. I just wanted to add that it was never really my intention to argue with this post as such. It was just that the 1st bit brought to mind a thought or two that I'd been having about the earlier ones, where I guess it would have been a little more appropriate to post it/them. Thanks Kass. I actually have not yet bought the score to Aires de Lando, although you're right, I should. You're welcome, I'll look forward to that. I'm also looking forward to your show on Saturday. Best! It´s funny you guys named the Landó rhythm after g wrote that "Nigerian Bell pattern"...that´s exactly the Peruvian Lando clave, as played by cajon and double bass most of the time (I don´t remember Maria´s piece though). Amazing posts on "Buleria..." and irrational meters, they have given me a lot of rhythmic food to chew. Thanks for leading to Kyle Gann´s amazin essay on totalism.